What is an articulated Boom? 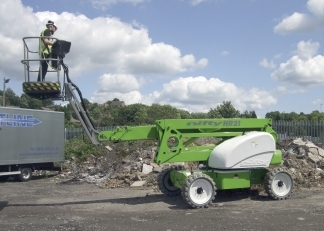 An articulated boom, also known as a cherry picker, is a mobile elevating work platform (MEWP) with sections of the boom that move or ‘articulate’ independently. This movement allows you to move up and over obstacles, providing precision and versatility in accessing hard to reach areas. 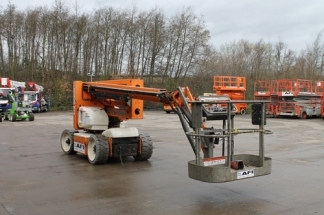 This type of machine is widely used within a large range of industries, as it allows you to lift both workers, tools required to areas of height safely. What applications are articulated booms good for? What is the difference between an articulated boom and a telescopic boom? With so many access platform options available, it can be tricky to know which one is best for your particular application. An articulated boom is ideal for confined spaces as the articulating joint, allows the machine to go up and over obstacles and barriers. These are also referred to as ‘knuckle booms’ or ‘up and over booms’. A telescopic boom extends its reach telescopically, so in a straight line, therefore offering greater horizontal reach. These are also known as stick booms because of their straight appearance. The joint or hinge in the middle of the booms here is the defining factor between the two. What training do I need to use an articulated boom lift? In order to operate an articulated boom, you will need category 3b IPAF training. 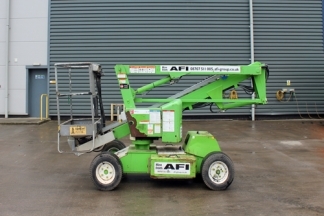 We can provide training in just the area you require, or we can provide IPAF training for 2 subjects, which will qualify you to operate machines that fall into the 1a, 1b, 3a and 3b categories, such as a scissor lift. If you have previously been IPAF trained, we also provide refresher IPAF training. Our team are experts in servicing and maintaining articulated booms. We can offer comprehensive service and maintenance packages and LOLERS to help keep your machines legal and your workers safe. We are also able to cover breakdowns at an agreed additional cost. Click here to find out more about our service and maintenance options. If you are still unsure which type of cherry picker or telescopic boom lift you need for your application, then get in touch and our experienced team will be able to talk you through your options.